The Pistahan Festival at Yerba Buena Gardens begins at 11:00 am and ends at 5:00 pm on both Saturday, August 10 and Sunday, August 11, 2019. The entrance to Yerba Buena Gardens is on Mission Street between 3rd and 4th Streets behind the Metreon. 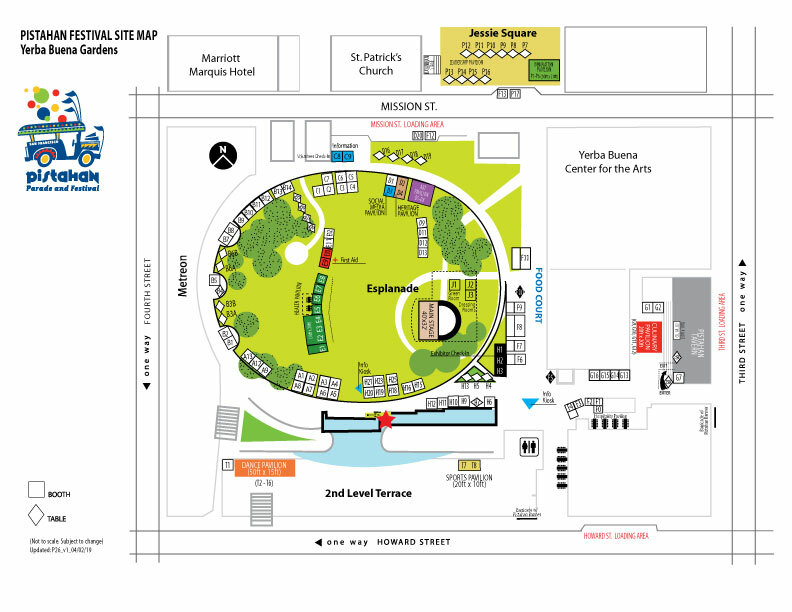 Yerba Buena Gardens also extends across Mission Street into Jessie Square where you can find the Martial Arts Pavilion and related vendors and activities. The nearest Muni and BART station is the Powell Street station. Upon exiting the station, walk down Market Street then turn right onto 4th Street. Walk one block to Mission Street to reach the Metreon. Yerba Buena Gardens in behind the Metreon building. Get directions. Take Highway 101 until it connects to Interstate 80 and exit at Fourth Street; Fourth immediately leads onto Bryant Street. Take a left from Bryant onto Third Street - the Gardens will be on your left between Howard and Mission Streets and immediately across Third Street from the San Francisco Museum of Modern Art. Take Interstate 80 and exit at Fremont Street. Take an immediate left from Fremont onto Howard Street and get into the right lane. Go two blocks and turn right on Third Street - the Gardens will be on your left immediately across Third Street from the San Francisco Museum of Modern Art. Take Highway 101 to Lombard Street. Follow Lombard to Van Ness Avenue and turn right; follow Van Ness until you reach Golden Gate Avenue and turn left. Follow Golden Gate as it crosses Market Street onto Sixth Street. Turn left from Sixth Street onto Folsom Street and follow Folsom up to Third Street; turn left onto Third—the Gardens will be on your left between Howard and Mission Streets and immediately across Third Street from the San Francisco Museum of Modern Art.